Digital billboards are one of the most visible and flexible types of advertising available. When used to promote community messaging and events, digital billboards can turn visitors into customers and become a city landmark. 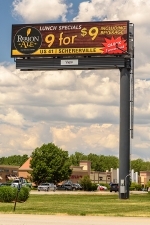 From welcoming visitors to your city and promoting local sites of interest, to advertising content that promotes local economic stability, digital billboards are a tool that can benefit communities of all sizes. Watchfire Signs capped off a stellar year by manufacturing the largest digital billboard of 2018 for bMedia Group in Puerto Rico. Brick and mortar businesses are moving away from traditional forms of advertising, instead investing in more forms of digital advertising. As technology advances and becomes more affordable, it gets easier to justify the purchase of video displays, digital billboards, or LED signs because of the ability they have to interact with customers and build relationships. Whenever you deal with a manufacturer, at some point the discussion focuses on warranties. Warranties are an important reassurance when making a major purchase, telling customers that the manufacturer will repair existing parts provide replacement parts free of charge.